Problem findings and service enhancement for MUNY artists in NYC. 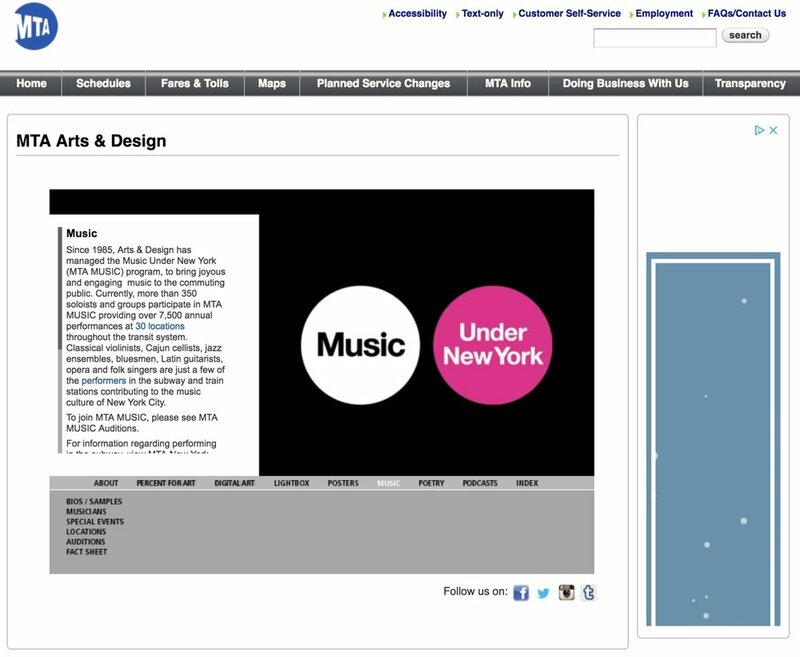 MUNY (Music Under New York) service existed for about 30 years, since 1987. It is one of MTA Arts & Design’s visual and performing arts programs. It’s purpose is to enhance the transit experience for customers. Currently there are more than 350 artists and ensembles as participants in the MUNY program presenting various genres of music such as classical strings, exotic drums, doo wops, and blues bands. These diverse musicians perform 365 days a year, providing over 7,500 annual performances throughout 30 highly visible locations in the subway. In order to join this program, the performers have to audition for its annual auditions held in Grand Central Terminal to be added to the MUSIC roster. To appeal to audience and judges, it’s ideal to reflect the culture and diversity of the people of New York City. Our team wanted to take this beautiful and unique service, MUNY - Music Under New York, to enhance its positive side and solve its problems. MUNY musicians are mostly concerned about promoting themselves, making new connections, and receiving direct reaction from the audience. They are frustrated about the scheduling process and communication with MTA staff. Our team decided to focus on their frustration on the scheduling system. Our team predicted some MUNY artists’ problems before we began the research. We assumed that the biggest challenge for the MUNY artists would be earning income. Also we considered the dirty environment and rude audiences to be problematic for the musicians while they are performing. So we decided to conduct several research methods, both qualitative and quantitative research, to either confirm our assumptions or to find the real problem for the MUNY musicians. Before the field research, we conducted secondary research. We searched for articles, studies, and videos to learn about MUNY service and the artists experience for the service. The estimated average income is $44,137 a year and confirmed that the lack of tip was not an issue. Also, we found the official Rules of Conduct for the MUNY permitted artists on MTA’s official website. From the observation and interviews, we discovered the scheduling of the performances. The performing time slot for single group is 3 hours. The MUNY staff individually assign time slot and location to each artists. This schedule email is sent every 2 weeks. The only way to communicate with MTA authorities is by phone call of email. The artists liked to interact with other artists and make connections. 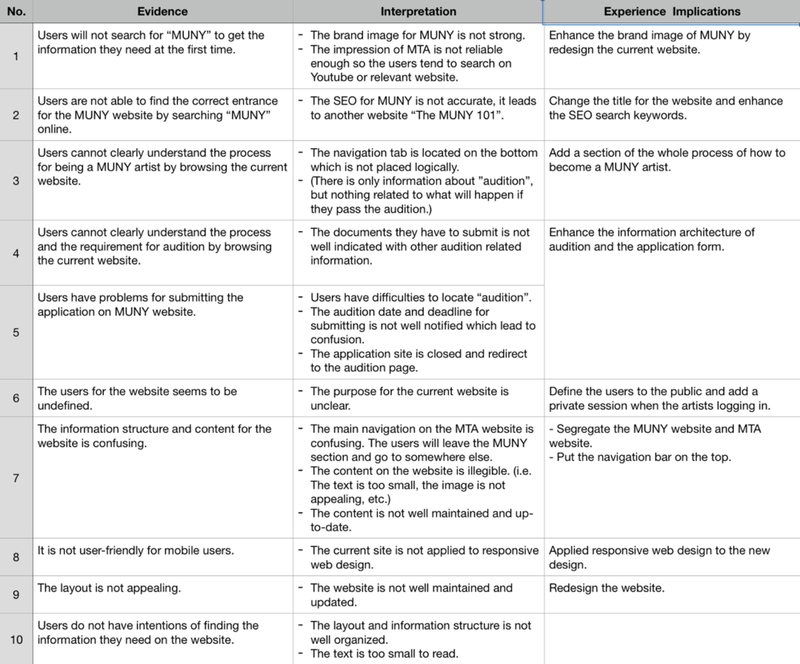 To evaluate the information alignment between MUNY service and users, we then conducted System Usability Scale Score to the current MUNY website to measure usability in numbers, which is the official platform for them to announce and inform information to their users. For the result of the SUS score, the users gave very low scores. They said the website was unnecessarily complex, not easy to use, inconsistent, cumbersome, and would not come back to this webpage again. The suggested average SUS score is 68. If the evaluation score is under 68, that means it needs to be fixed. Based on our evaluation, the current MUNY page got 32.5 average score. After evaluating system usability scale score, we conducted a Usability Test to test the legibility of MUNY service information on current MTA Website. We observed them through the process of trying to gain information about MUNY program and audition application on the website. Based on the their digital use preference, we gave them choice of laptop or mobile phone. The three users, Felix, Naomi, Andrea were all from different background and had different interests in terms of pursuing music, however, their user interaction with the website shared similar reaction and problem. The entry point of the website. When they searched for the website, all of them clicked the different website, not MUNY website, and got confused. They were frustrated about the navigation tabs. The layout of the website and the information provided on the webpage was unclear to all users. Get notified about schedule only via email from MTA. So the artists don't know about other artist's performance. The layout and ux is hard to obtain information. 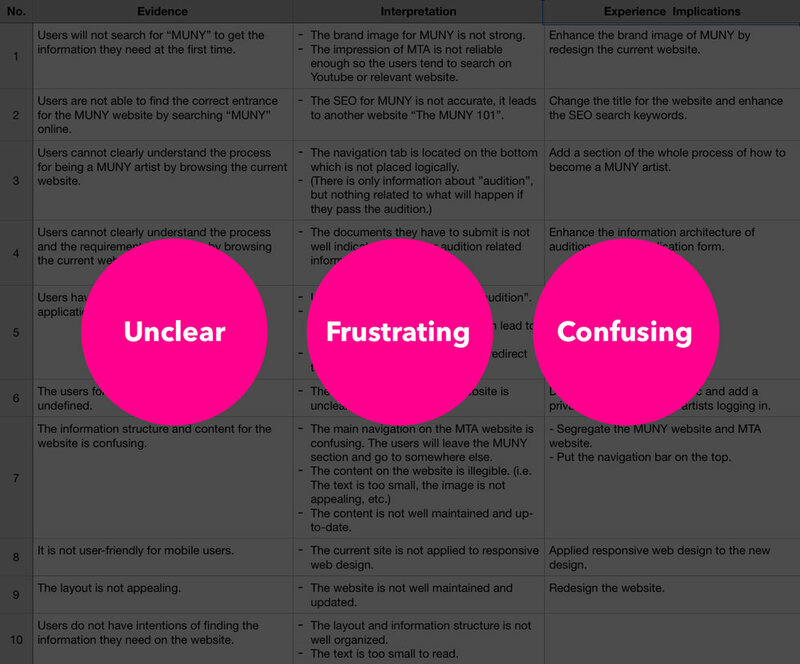 Based on our research and findings, we came up with a user journey map for the average MUNY artists. The journey begins from the user discovering the service and then continues to join the service. Once they get into the program, their routine becomes like this. When artists who wants to get MUNY permit check out the audition and program information, the website can clearly provide them with correct and enough information. Once they became current MUNY musicians, they can check the schedule on the website after they login. The future blueprint will look like this. We are enhancing their touchpoint which occurs twice in the system. The customer will user the website when they first enter the service, the auditioning, then they will continue to use the website regularly once they are in the service. They will check the schedule on the regular basis and in the future will be able to manage and exchange their schedule. In the backstage, the staff, instead of emailing the schedule individually, can update the weekly schedule all at once which will reduce their task and time. Also, once the calendar is updated on the website, all the MUNY musicians can view each other’s schedule and ideally artists’ fan can visit the website to see who is performing where. The contents marked in black are the general information which can be viewed by the public. It contains information of MUNY, upcoming events, and artists, and how to become a MUNY artists. By segregating the features in the website, we tried to make the communication among MUNY community more transparent and simple. For MUNY artists, after clicking "sign in", they can check their assigned schedule, see the whole performing schedule of other MUNY artists and exchange the schedules with one another. 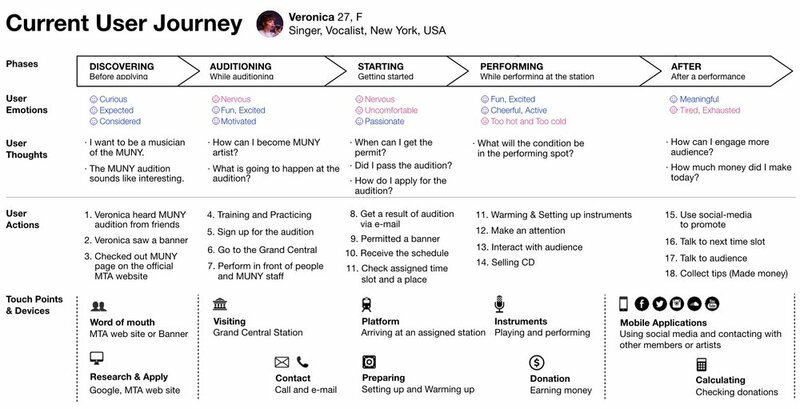 In this UX flowchart, the user actions for MUNY artists are separated into two parts, Request exchange and Requested exchange. They can exchange the schedule in the private calendar after they logged in. Also, for MUNY maintenance, we planned to build the backstage system for the MUNY staffs to assign, update, and monitor the schedule. They can start the exchange system in their private calendar. The MUNY artists are able to request an exchange one at a time to other artists. In this flow, there are two results, "exchange successfully" and "exchange failed". Moreover, if their exchange fails, they can contact MUNY staffs. In the "status tab", MUNY artists can track their requested exchanging schedule. The user’s action will be "Accept" or "Decline". We credited a simple design of minimalist web interfaces. Our minimalist web design strategy is simplifying interfaces by removing unnecessary elements and content that does not support user tasks, because the fewer elements on a screen, the more potent the remaining information become such as the promotions of artists and their calendar UI. By that logic, MUNY website can clearly communicate to the users. The prototype below shows the private schedule pages. The current MUNY artists will log in to this page, then check their schedule and request for exchange if the assigned schedule does not work for them. On this private schedule pages, the user can view their schedule for the whole month. The exchange process is clear and simple. For example, the user can click the date she wants to exchange, then the detailed schedule information for that day will pop-up. Then, she can select another date and time she wants to exchange and simply click request button at the end. On the image above on the last frame, the pink badge UI component is currently scheduled date and the blue badge UI is the date she wants to exchange. Wanna solve problems together? Let’s chat!